Hilton Guest Room - Welcome to this modern 36mÂ²/387sq.ft room with wireless internet. The bright and airy room, in cool, calm tones, has opening windows. Get to work at the desk, take time off to watch the 25-inch TV or re-energize in the marble bathroom with 3 jet body shower. Some rooms have easy chair, sofa or city views. Suites - Spoil yourself in this contemporary 56mÂ²/602sq.ft suite offering Executive Lounge access with free breakfast and refreshments. Get to work at the desk (some with ergonomic chair) or keep in touch with wireless internet. Some suites have large bathrooms, separate working area or seating area with sofa. Deluxe Room - Indulge yourself in this contemporary 43mÂ²/463sq.ft room with wireless internet. The spacious room, in cool, calm tones, has opening windows. Catch up on work at the desk or pamper yourself in the marble bathroom with 3 jet body shower. 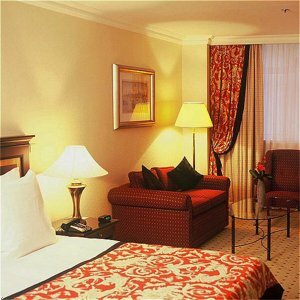 Some rooms have a seating area with sofa, easy chair or city views. Executive Room - Work is easy in this modern 43mÂ²/463sq.ft room offering Executive Lounge access with free breakfast and refreshments. Work in comfort at the desk with ergonomic chair or surf the web with wireless internet. Some rooms have a seating area with sofa, city view or easy chair. Take the A201 and exit at junction 4 onto the R0. Exit at junction E19 and continue along the E19/A1. Exit at junction 5a onto the R1. When you reach Antwerp exit at junction 5a Schelde, Hoboken and carry on to the Brusselstraat, then Bolivarplaats. Turn right on the Emiel Banningstraat, go through Lambermontplaats and onto Leopold de Waelstraat. Go through the Leopoldplaats and Nationalstraat and you will arrive at Groenplaats. Directions: At Antwerp, right onto Vosstraat, left onto Diksmuidelaan, left onto Borsbeekbrug, right onto Binnesingle and left onto Plantin en Mortuslei. Take N184 to Leopoldplaats, left at Komedieplaats you'll arrive at Groenplaats. This Antwerp restaurant has a bistro-style ambience with stunning views of the cathedral. Savor dishes like lobster soup and grilled beef entrecote from the kitchen of celebrated Chef Gert Jan Raven. Enjoy breakfast or lunch on the Hilton Antwerp hotelÂs outdoor terrace overlooking Groenplaats. Decked out in a nautical style with leather couches, this stylish Antwerp bar has views of Groenplaats. Enjoy a cocktail before dinner or relax with a single malt whiskey. Make a date for an informal meeting with colleagues at the Hilton Antwerp hotel, and be sure to sample one of the Belgian beers. Savor the Hilton Antwerp hotelÂs signature afternoon High Tea while relaxing in the elegant Lobby Lounge. Dine on pastries or a sandwich with friends, or read the papers while enjoying a coffee in this Antwerp cafÃ©. Decorated with antique rugs and furniture, the Lobby Lounge has an old-world charm. The Belle Epoque Ballroom can be decorated in a variety of styles, all set off to spectacular effect by an impressive crystal chandelier. The ballroom is ideal for any big event: conferences, exhibitions, product launches, car presentations, gala dinners and weddings. There are no pillars in the room and facilities include removable dance floors, screens up to 6 m, additional lighting, podiums and high-speed wireless internet access. Daylight room with business service. Hilton Meetings Manager available, Hilton 8 hour chairs. High Speed Wireless Internet available. Hilton Meetings. Daylight room with business service. Hilton Meetins Manager available, Hilton 8 hour chairs. High Speed Wireless Internet available. Part of Ballroom, can be used for luncheons, buffets. A conference and banqueting room for conferences, dinners, parties etc. High-speed wireless internet available. This conference and banqueting room can be used in combination with Teun for dinners, conferences, parties etc. High-speed wireless internet available. Conference & Banqueting Room can be used in combination with Lijn Room for dinners, conferences and parties. High Speed Wireless Internet available.